HARRISBURG – Imagine having cancer and being told instead of going through intravenous chemotherapy, your best treatment option in fighting the disease is to take a pill every day. This pill would be more effective; produce fewer side effects than traditional chemotherapy; and would not require regular trips to a medical facility. You would be relieved, right? Now imagine being told the medication will cost you between $1,400 and $3,500 out of pocket per month, which is more than your take-home pay each month. That is what some cancer patients in Pennsylvania are currently facing. 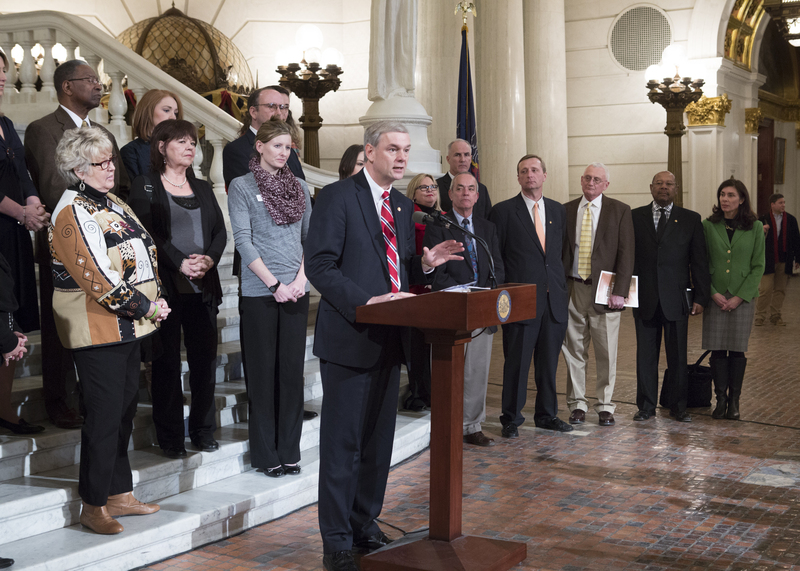 Chairman of the House Health Committee, Rep. Matt Baker (Tioga/Bradford/Potter), is making it his personal mission to fight for Pennsylvania’s cancer patients. Legislation spearheaded by Baker to make oral anticancer medications more affordable for patients was successfully passed by the state House last year, but the Senate did not take action before the end of session; therefore, Baker is leading the charge again and has reintroduced his legislation, which passed overwhelmingly today in the House. House Bill 60 would help address the cost disparity between intravenous and oral anticancer treatments. Currently, intravenous anticancer medications are typically covered under a health plan’s medical benefit, often only requiring patients to pay a minimal fixed co-payment; however, oral anticancer medications are covered under a health plan’s pharmacy benefit, and require patients to pay a percentage of the total cost of the drug, generally between 25 percent to 30 percent. With the average cost for a one-month supply of an oral anticancer medication costing $7,000, some cancer patients in Pennsylvania are left with a coinsurance cost of between $1,400 and $3,500 per month. This obviously creates an enormous financial barrier for most patients to follow through with their doctor’s prescribed course of treatment. Baker also noted that studies have found that high out-of-pocket costs directly impact patient compliance with oral chemotherapy medications, ultimately resulting in higher long-term health care costs. One in six cancer patients with high out-of-pocket costs abandon their medication at the pharmacy. Patients with an out-of-pocket cost greater than $200 were at least three times less likely to fill their prescription than those with out-of-pocket costs of $100 or less. Baker noted that since targeted cancer therapies, such as oral anticancer medications, were introduced in the early 1990s, the number of cancer survivors has more than doubled from about 6.8 million people to 14 million people today. To date, 34 states have enacted similar legislation to control out-of-pocket costs for cancer patients, including all bordering states to Pennsylvania with the exception of West Virginia. More than 20 health-related organizations support passage of House Bill 60, which was approved in the House by a vote of 197-3, and now awaits consideration by the state Senate.